Marie `Missie' Vassiltchikov as a White Russian emigree caught with her family in Hitler`s Germany at the outbreak of the war. Before long, however, Missie became sickened by the brutal and repressive nature of Nazi rule which overshadowed every aspect of her life. 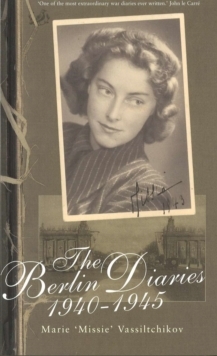 Through Adam Von Trott, for whom she worked in the Information Department of the Foreign Ministry, she became involved in the Resistance and the diaries vividly describe her part in the drama of July 1944 and its appalling aftermath. Living among the ruins of Berlin during Allied bombing raids, she grows us to be strong-minded, committed and courageous woman as she daily displays uncommon bravery in the face of the Gestapo and the detestable Dr Six of the SS. Having survived the Nazis, Missie ends the diaries as she flees from Vienna, where she has been working as a nurse, before the advancing Red Army.